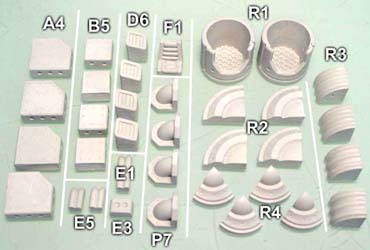 Below are several basic pieces you can make using mold #326. 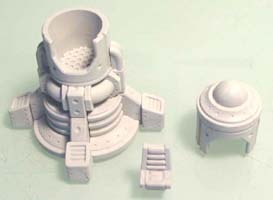 These include barrels, crates, chairs and gun turrets. 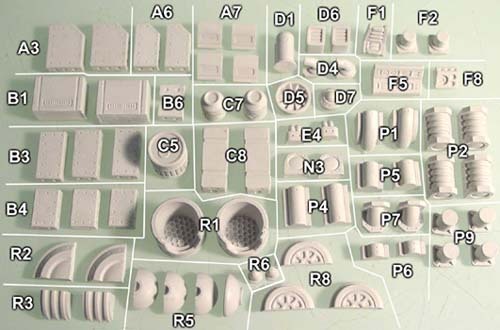 These types of pieces are the easiest to construct and use. Click on the photo for a larger view of these. 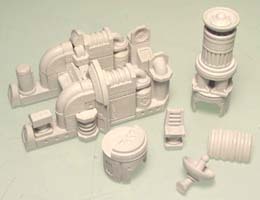 I painted the barrels and crates a little differently than the rest of the machinery pieces found on these instruction pages. First I painted them a solid medium color (blue, green, red, brown, etc.). Then I gave them a coat of ink wash. You can find the ink wash mixture on the previous page's painting instructions page. The final coat was a dry brush of a lighter base color. If I had painted a crate blue, then I would dry brush it with light blue (a mixture of half blue and half white). 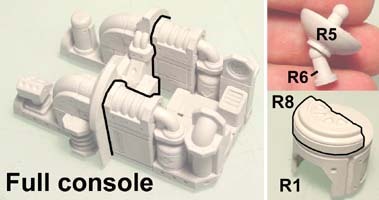 Afterwards you can add other small details such as painting the view screens or small lights on the console pieces. I glued all of these items together in small clumps so that a whole crate pile could be added to one square of the game board as needed. 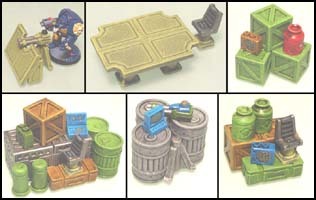 These can be used as cover or obstacles during game play. 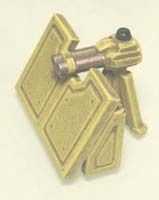 The turret includes a shield and the gun on the tripod. The shield measures 1.5" across, so you can place it blocking a hallway made with 1.5" floor tiles. Glue the table base together and also the shield halves for the table top. Once the glue is dry, glue the table top onto the stand. The chair is painted with silver sides and a black seat. The seat is dry brushed gray. 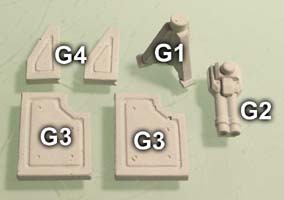 Here are the parts needed for the escape pod. Assemble the chair and top as shown. Glue 4 of the rounded corners. Stand them up and place the thin square and angled blocks between them leaving a large hole in the center as shown. If you do not slide the B5 pieces out far enough, the conduit pieces will not fit around the outside later on. Glue an R1 on top of the thing, then add two E5 pieces, one on each side. Finish the piece by adding an E1 onto the back center and glue four D6 pieces on the end of each leg. 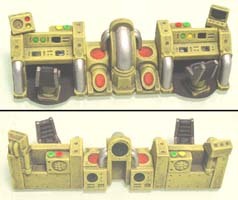 Here are the 3 pieces that make up the escape pod. Do not glue these together until after you paint them. I did not include a plastic window but it could be included if you wanted one. 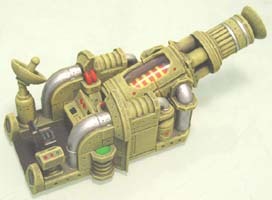 For instructions on adding the plastic window, see the death ray instructions section. Click on the photo for a larger view. Next assemble the center pipe by gluing the 3 pieces shown, then adding the 2 additional pieces on the top of it. These 2 block assemblies will go on each side of the center pipe piece. Glue the E5 conduit pieces on each side of the center pipe. The center pipe console is finished. Do not glue the blue blocks. Only place glue on the sides of the console. Add the A3 pieces on each side. Remove the blue blocks. Make 2 of these pieces. Turn them around and glue the pieces shown on the back side. Turn them back around and add the pipe pieces onto each front. Here are the 5 pieces that make up the navigation console. Do not glue these together until after you paint them. To keep the chairs in place I glued pieces of black construction paper under them. 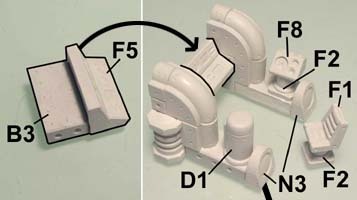 The main console of the gun is made using several steps. Start by gluing two flat blocks to the back of the ridged decorative pieces. Then glue these additional pieces onto both, making mirror images of each other. The center part of the console is made by gluing the flat block under the F5 piece. Then place each mirrored half of the pieces on each side so the ridged pieces are on the outside. Glue the additional pieces onto this and also assemble the chair. 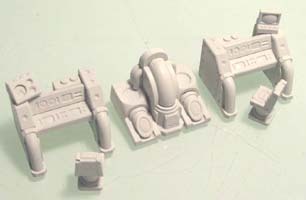 The back side of the console starts with these flat pieces. Once this section is dry, stand it up and glue it to the back of the console you have already built. Now glue the 3 new pieces shown. We're going to extend this console with a couple of additional pieces. Glue together these two sections that are mirror images of each other. Glue two crates between them scraped side down and also glue on the decorative pieces shown. Glue this piece from step 5 onto the piece from step 4 to make the full console. 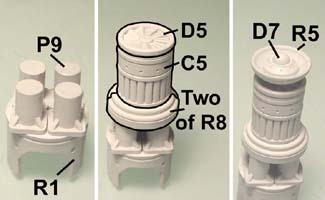 We will also add a radar dish made from two R5 and two R6 pieces. This will be glued on after painting. The last piece will be the bottom of the gun barrel. Glue these two pieces together. This bottom will not be glued to the full gun barrel until after the thing is painted. The main gun barrel is made from pieces stacked up onto the R1 piece. The four P9 pipe stands will be glued on and their flared bases will stick out beyond the R1 piece. Next glue two of the R8 pieces, a C5, a D5, two R5s and cap it off with a D7 piece. Glue two of the R3 pieces together and let them dry. Next, sand the edges of this ridged piece until it will fit between the two halves of the gun barrel. For the clear plastic window in the gun barrel, I am using plastic notebook dividers. 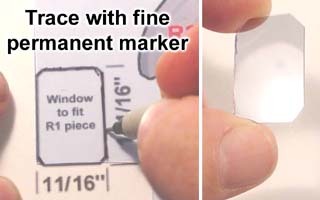 These clear dividers are fairly stiff but you can still easily cut them with scissors. 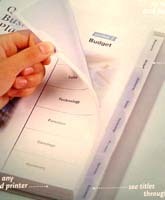 This particular brand is Wilson Jones 8 tab transparent dividers #W55068 (right photo). To glue in the decorative center, put glue only on one half of the tube. Place the decorative center in, slide the other half of the tube together and then position the decorative part so it lies in the middle. Let this dry completely. When you take the two halves apart, the decorative center will be stuck to one tube piece only.